Born in 2011, South Sudan, the youngest country in the world and one of the least developed is plunged into a civil war since December 2013, when soldiers loyal to the President, Salva Kiir, a Dinka, and those loyal to former Vice-President Riek Machar, a Nuer, fought in Juba, the capital, following months of growing political tensions. 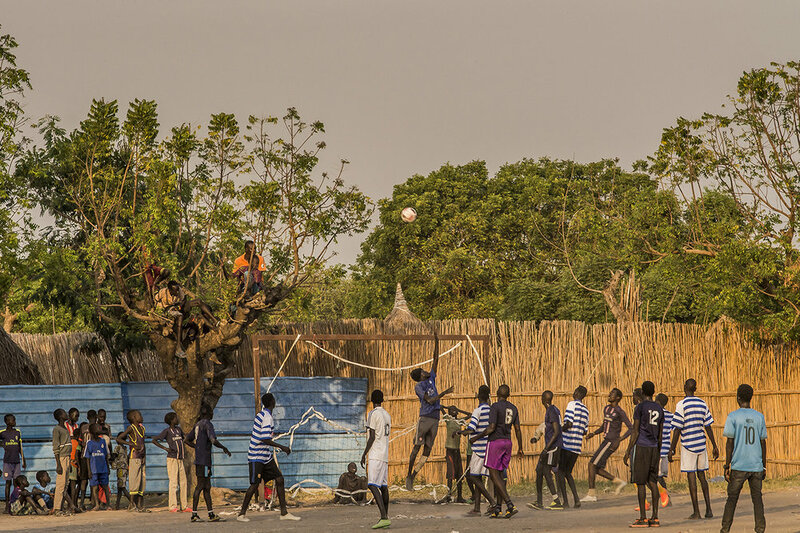 Since then, intense violence, fighting, serious abuses against civilians by government or opposition forces have forced nearly 4 million people - about one in three South Sudan - to flee, including more than 1.9 million internally displaced persons. 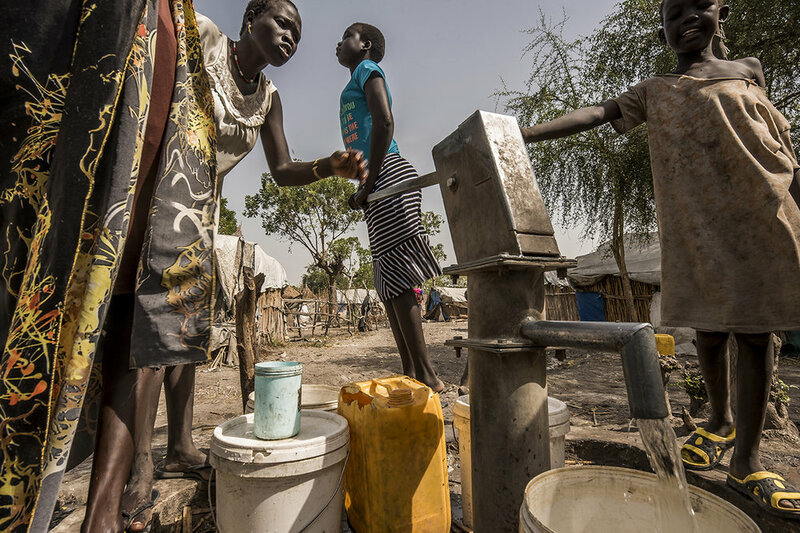 More than 2 million people have fled as refugees to neighboring countries (the number is expected to reach 3 million by the end of 2018, making South Sudan the biggest refugee crisis since the Rwandan genocide). The SPLM in opposition (SPLM-IO), the main armed opposition group, is composed primarily of Nuer forces, the second largest tribe in South Sudan. Their heartland is located in the Sudd, an Arabic word deriving from sad, meaning "barrier or obstruction ». It is a vast swamp stretching from Bor to Malakal towns. Along the river Phow (Zaraf, giraffe in arabic), a branch of the White Nile, in Jonglei State, 100 kms southwards of Malakal, lays the town of Old Fangak (OFG)., only accessible by boat or small aircraft. Before the civil war, OFG was home to about 5,000 people, with another 10,000 living in the surrounding area. Since 2014, some 45,000 IDPs have sought refuge in the little town, fleeing fighting up and down the Nile, as Old Fangak is widely known as a safe area, partly through environmental conditions (isolated by the Nile & Zaraf rivers and the surrounding swamps). The influx roughly doubled the population, with OFG being resident to around 35,000 inhabitants. Refugees continue to arrive in Old Fangak every day, the vast majority being women and children, with urgent needs for food, water, shelter and medical care. Some come by chance, others because they heard it was safe. They stay as there is clean water to drink, food in the market and a fully functioning clinic. Further East, on the Ethiopian border, Akobo, the last big town held by the opposition. For the population – both the host community and the IDPs – there is a lack of access to primary health care. With no drugs or medical staff, the health facilities have been totally abandoned or diverted to other uses. As this is all opposition held territory, the Ministry of Health via Juba has not been supporting any activities either. By analysing the current conflict dynamics, it can be anticipated that the Government of South Sudan will launch a new military offensive in opposition-controlled areas after the 2017-2018 rainy season, once roads become passable again for heavy military equipment. So far, the best protection for the inhabitants of the Nuer SPLM-IO stronghold is that the warring parties in South Sudan are pursuing a negotiation process, albeit heretical. Today, marsh people live like islanders, trying to pursue a semblance of normal life, a sword of Damocles over their heads. In the operating room built and run by MSF France, an international NGO, Bial Ruoat, about 30 years old, has just been anesthetized. It was brought the day before by 7 people from Khartoum. He says he has paralyzed his legs for 10 days and no longer feels his lower limbs. Worried, he decided to return home to Nuer country. During his stay in Khartoum, he got on a motorcycle taxi. His foot was caught on the shelves or dragged on the ground, while his calf was sticking to the muffler. Feeling no pain, he does not remember anything. He arrives in Old Fangak with severe burns and a big toe, whose bone is raw. He will have to be amputated. With the possible return of an armed conflict, Old Fangak offers one of the rare sites of access to surgery for the inhabitants of this region of Southern Sudan. Village of Kier, along the Pibor River, border between Ethiopia and South Sudan. John Lam examines a pregnant woman lying on a mattress brought for the occasion, in a consultation area of the mobile clinic of MSF Switzerland, set up for the day. Made up of 6 people (nurses, medical workers and drug dispenser), it received 43 patients. This site, 1.5 hours from Akobo, the last city held by the rebellion, was identified by MSF Switzerland to build a logistics base and a health center for the population, in fact opposition supporters. Indeed, the analysis of the dynamics of the current civil war suggests that government troops will attack Akobo, sooner or later as it is a strategic crossroads and the last urban center held by the rebellion. The inhabitants will certainly flee and disperse in the bush along the river towards the south or the north. MSF Switzerland expect that the people will come to one of the 7 points to seek help, including this one, the furthest from the expected Governmental military push.